NASA’s Spitzer and Hubble Space Telescopes joined forces to create this striking composite image of one of the most popular sights in the universe. 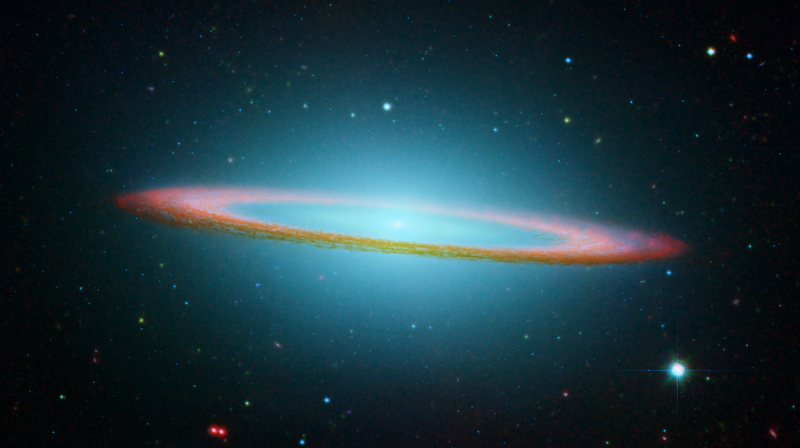 Messier 104 is commonly known as the Sombrero galaxy because in visible light, it resembles the broad-brimmed Mexican hat. However, in Spitzer’s striking infrared view, the galaxy looks more like a “bull’s eye.”â¨â¨In Hubble’s visible light image, only the near rim of dust can be clearly seen in silhouette. Recent observations using Spitzer’s infrared array camera uncovered the bright, smooth ring of dust circling the galaxy, seen in red. Spitzer’s infrared view of the starlight, piercing through the obscuring dust, is easily seen, along with the bulge of stars and an otherwise hidden disk of stars within the dust ring.â¨â¨Spitzer’s full view shows the disk is warped, which is often the result of a gravitational encounter with another galaxy, and clumpy areas spotted in the far edges of the ring indicate young star-forming regions.â¨â¨The Sombrero galaxy is located some 28 million light-years away. Viewed from Earth, it is just six degrees south of its equatorial plane. Spitzer detected infrared emission not only from the ring, but from the center of the galaxy too, where there is a huge black hole, believed to be a billion times more massive than our Sun.â¨ This magnificent galaxy has a diameter that is nearly one-fifth the diameter of the full Moon. Image courtesy of NASA’s Spitzer and Hubble Space Telescope. In Hubble’s visible light image, only the near rim of dust can be clearly seen in silhouette. Recent observations using Spitzer’s infrared array camera uncovered the bright, smooth ring of dust circling the galaxy, seen in red. Spitzer’s infrared view of the starlight, piercing through the obscuring dust, is easily seen, along with the bulge of stars and an otherwise hidden disk of stars within the dust ring. This magnificent galaxy has a diameter that is nearly one-fifth the diameter of the full Moon.